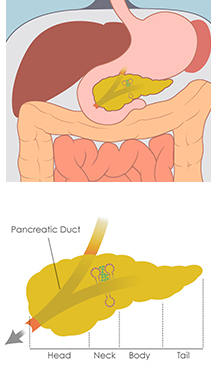 The pancreas is a 6-inch long gland located deep in the belly, surrounded by other organs including the stomach, small intestine, liver, spleen, and gallbladder. As a gland, the pancreas creates chemical substances for release into the body. These substances help the body with digestion, metabolism, and insulin production. When the pancreas functions properly, the body regulates digestion of food and absorption of nutrients in a normal way. When the cells in the pancreas start growing abnormally, a cancerous (malignant) pancreatic mass can develop. This may cause problems with the pancreatic function, such as preventing enzymes and juices from exiting the pancreatic ducts. Learn about the different types of pancreatic tumors.